How long would you wait for a good bowl of topped rice? An hour? More? We waited an hour and half on a Monday lunchtime in the queue that snaked outside this humble tendon specialist. There were no local Nihonbashi workers in the line; everyone was a tourist, with time to spare. Orders, from the briefest of menus, were taken just before entry. If you’re lucky you’ll get one of the six counter seats on the ground floor, facing the chefs at work; less fortunate, and you’ll be led upstairs to the less characterful room above the kitchen. 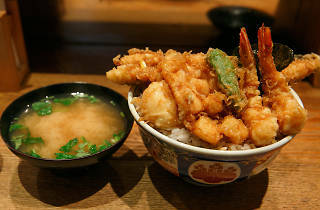 The reason for the almost holy devotion is clear once your tendon (tempura on rice) arrives. 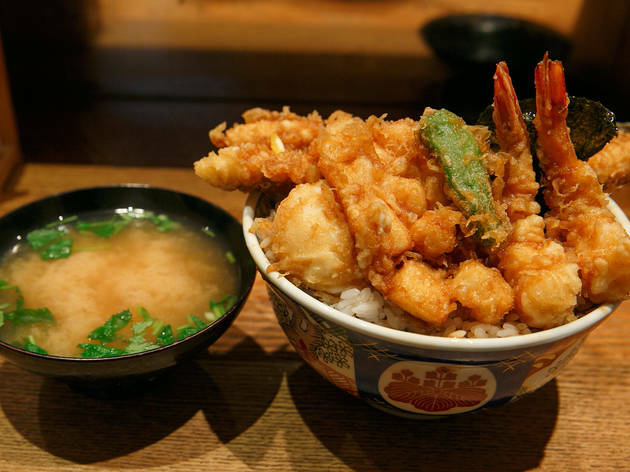 It’s tempura perfection: light batter, golden and crisp, encases precisely and perfectly cooked seafood. Two shrimp, diced squid, a remarkably large white fish and a square of nori, all dressed with a moreish tentsuyu sauce just before serving. The rice is also perfectly textured and delicately aromatic, a mound so huge you’ll be grateful for the appetite you built up waiting in line. The standard-sized portion costs ¥950; only ask for the large (omori) portion if you’re really hungry. The miso soup costs an extra ¥120, but it’s really worth it; intensely savoury with umami, it’s the misoshiru of dreams. If the hour-plus wait seems inexplicable, just remember that a cappuccino costs ¥900 in one of the swanky department stores nearby; for ¥50 more, you can have manna from heaven.